Today we had our last interview. It was done in a fancy VIP lounge of a shopping mall where we talked with a PR manager of a local hotel. 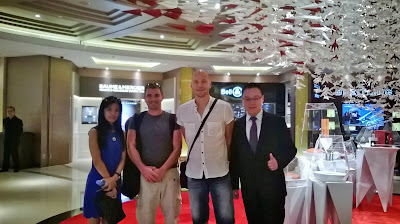 Again, we were able to enjoy very interesting inside insight into the gambling scene. 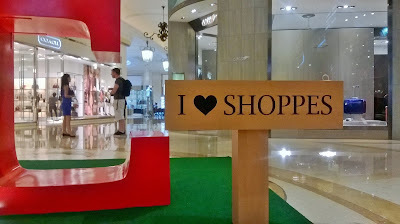 Getting to the rendez-vous place at the mall. After the interview we said goodbye to our efficient interpreter and contact-maker Pingli, and for the rest of the day we didn't film anything anymore but spent it soaking in the atmosphere of the city, sorting out our data and planning the future of our project. We counted that we have recorded about seven hours of footage which is a great beginning for a full length documentary, let alone a short film we are going to finalize in November/December. Thus, we felt we had earned a little R & R at our hotel's pool area. Tomorrow we will head to Hong Kong, and have a few days off before returning to Finland. In the meantime as well as in the future, we will gladly welcome any comments, contacts and suggestion related to our project. Blessed be the late mornings for they help fieldworkers recover! Today our hearts rejoiced for not having a scheduled meeting until noon. 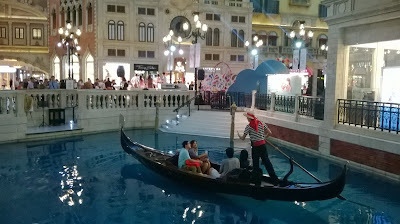 Then we took a bus to the Venetian, grabbed our interpreter Pingli, and continued to the Historical Archives of Macau to fetch the old photos we had ordered two days ago. Our next interview was at the Macao Polytechnic Institute where we got a chance to interview a croupier supervisor who - like all our interviewees - had interesting insight into the Macanese gambling scene. 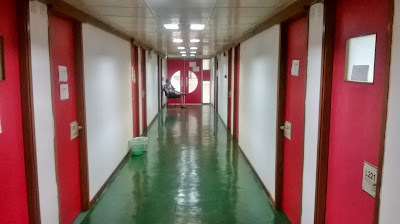 When the interview was over, we thought we had done our duty as far as interviews were concerned. 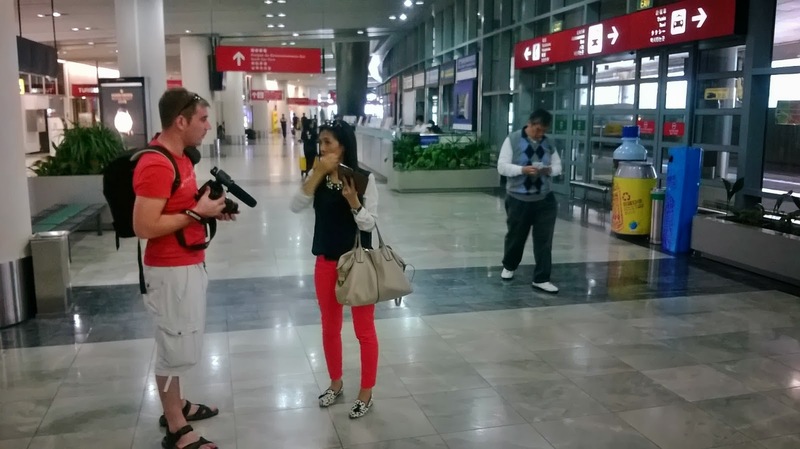 However, our interpreter Pingli was called by a contact working in a Macanese hotel as a PR manager. He was ready to be interviewed tomorrow. 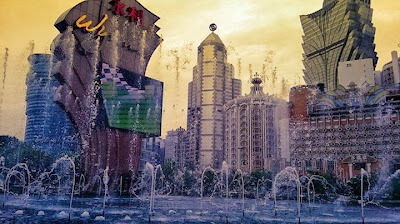 The afternoon was spent in moving to another accommodation, from a Coloane apartment to the heart of gambling Macau, a hotel in the Cotai Strip. A scence from the Cotai Strip. Ordering pork chop burgers in Taipa village on our way to an interview. Today we did five interviews. For the first two we interviewed two college students majoring in accounting and international studies. Both had come from mainland China to experience the vibrant Macau. Neither of the two gambled but still had interesting things to say about gambling in Macau. 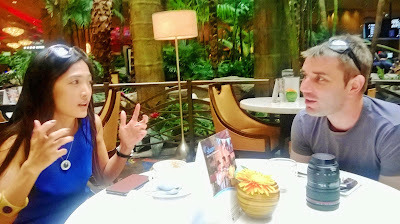 Then we interviewed a Chinese lady who had lived in Europe and the US, and had come to Macau when her husband got a job here. She also had plenty of experience on gambling albeit she, like so many in Macau, was not a regular gambler herself. The fourth interviewee was a student as well like the first two interviewees today but her specialty was indeed gambling. She studied to become a croupier. She had experience on working with gambling tourists in her husband's company, and now she wanted to get an official vocation in the field. She too did not gamble herself - at all. Then we went to the Macau airport to interview an airline service official whose job was to coordinate the tourists' trip to Macau. 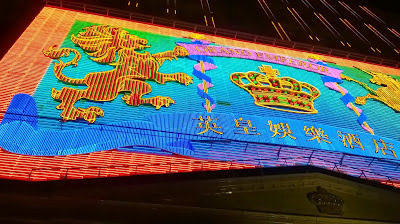 One among the interesting and perhaps amusing things she told us was that for the most enthusiastic tourists that come to gamble in Macau, an announcement of the delay of the return flight is surprisingly well reacted to - it only means extra time to go back to a casino to play! Ronan and our interpreter at the Macau airport. After a brief moment of rest and recreation in our apartment in Coloane, we headed back north when it became dark. First we took some night shots of Macau on the top floor of the Macau Tower. Thanks to Ronan's persuasion skills we got to stay a bit after the closing time to get the best shots without all the lights on on the top floor. 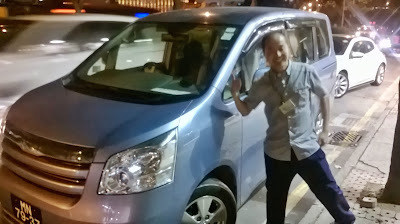 Then we hired a taxi to drive us around the casinos in Macau and Taipa to get more cool night shots. Our very informative and helpful driver Samson even ordered us pizzas amidst guiding our tour. Today started with an interview with Professor Tim Simpson from the Department of Communication of University of Macau. Tim is a specialist in tourism and post-socialist consumption practices as well as themed environments and consumption (among other things). He told us how Macau can be seen as a laboratory of consumption where People's Republic of China tests market economy in its most dense form, capitalism based on gambling. He also told us about the short history of big casinos in Macau, the intricacies of employment in casinos as well as the activities of junket entrepreneurs who bring gambling tourist groups from mainland China. In addition to that, he provided us with many great further contacts for our project. After interviewing Professor Simpson, we started our journey towards the Historical Archives of Macao. We call it a journey because the normally 15-minute ride from the university to the archives took us about 3,5 hours (by foot, taxis and buses - and including lunch). To make a long story short, it is hard to travel quickly from point A to point B through the congested traffic of Macau if 1) there are few taxis, 2) you don't really know where the buses are going, and 3) if you have wrong assumption about the location of point B, and 4) you bump into a Pizza Hut on the way. Eventually, we did get to the archives, and got us some great historical photographs of old Macau. 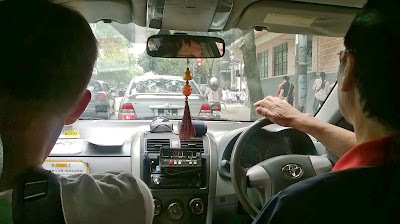 Then, we hurried back to the university for another interview to find out that the interviewee had to cancel.This, however, gave us time to look for our camera bag that we noticed I had left in the taxi. Fortunately, I had kept the receipt that had the taxi's number, so together with a professor passing by and three friendly security guards we could call the same taxi back to the university - and we got our bag back in no time. The taxi that drove around with our camera bag. After reuniting with the camera bag, we proceeded to interview our next scheduled academic, a fellow anthropologist/film-maker Professor Peter Zabielskis at the Department of Sociology. Peter told us about the ingredients of Macanese identity vs. Macao identity, and his research about the interaction between built environment and identities. When we asked Peter, a native Manhattanite, how he had ended in Macau, he replied that his desire has always been to travel as far as possible, and Macau is pretty much just there from New York. We think that if there is such thing as an anthropologist's ethos, that's probably it. 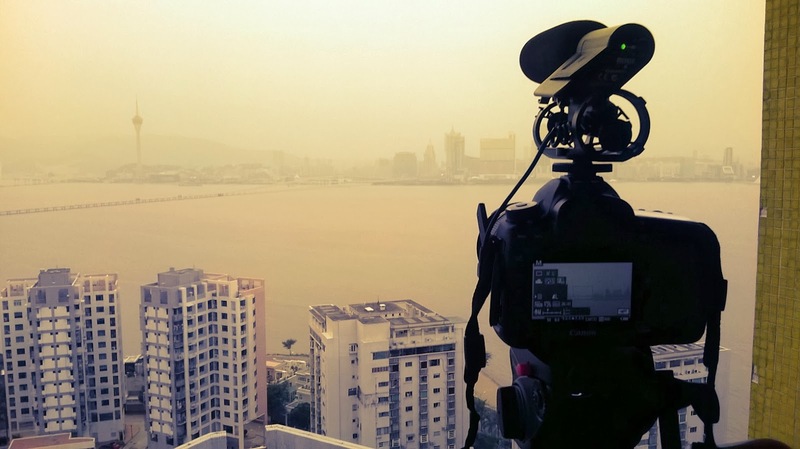 We ended our day by going a few floors higher from Professor Zabielskis' office to shoot a time-lapse video about Macao's skyline turning from day to night. Luckily, the way back home didn't take us more than a half an hour. Filming Macanese day turning into night. 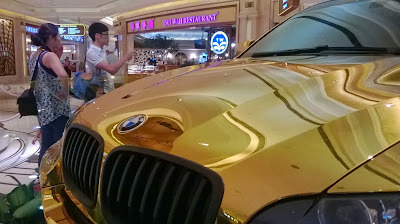 Golden BMW at the Venetian Macao. 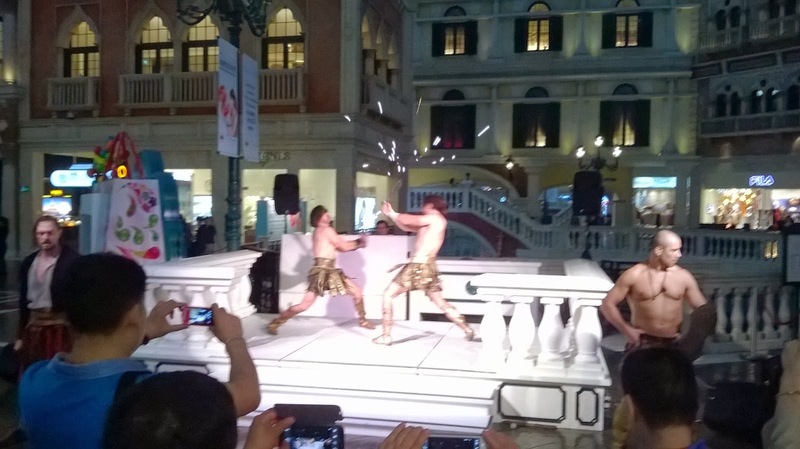 After the Venetian, we went to the Sands which is part of the Venetian casino, the City of Dreams and the Galaxy. In the City of Dreams we saw the biggest diamond ever with unforeseen hurly-burly around it. Diamonds are the casino-goers best friends. After touring around the casinos for the morning, we headed uphill to University of Macau, where we got a chance to interview Professor of Political Science Bill Chou with great insight into Macanese society and the role of gambling in it. 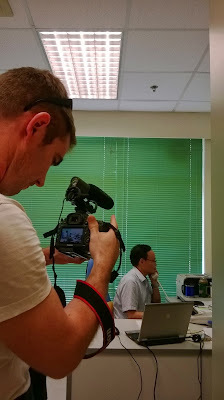 Then we headed to the Macao Polytechnic Institute to interview Professor Samuel Huang who is also the Director of the Asia-Pacific Association for Gambling Studies. After meeting with the professors we had some time to kill before the dusk and night shots, so we went to the Portuguese part of Macau and took a tour in the Museum of Macau. Then we walked around the center of Macau filming the crowds, and finally got our perfect night shots of the casino lights (right here on Google Maps). 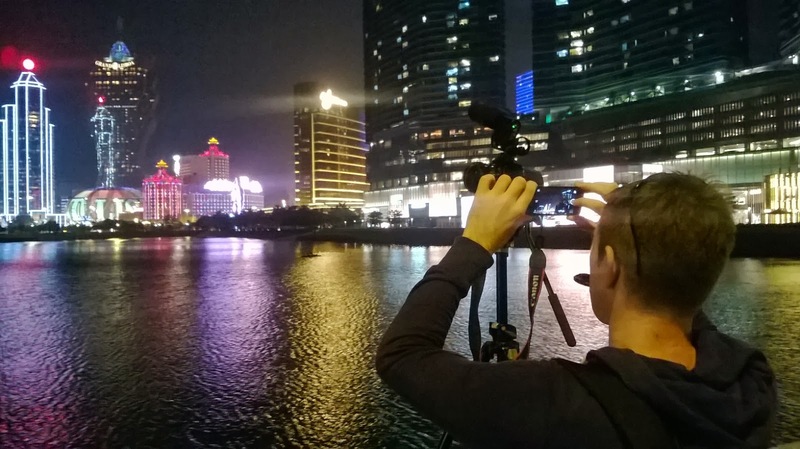 Recording the night scene downtown Macau. 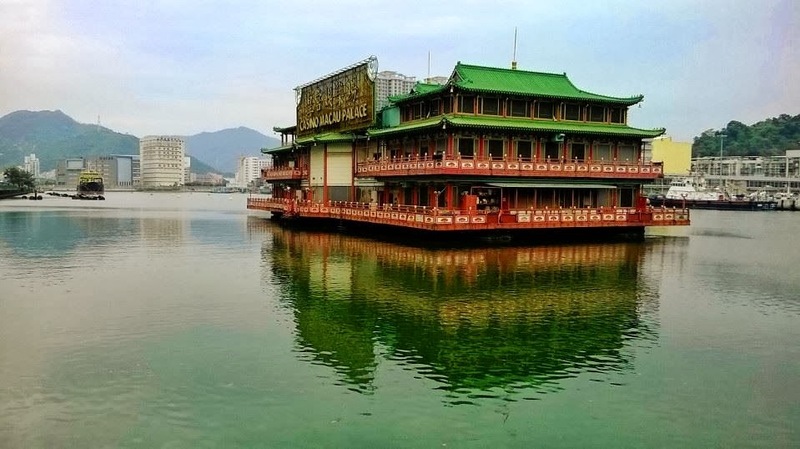 Tomorrow we will head back to the university and discuss Macau and gambling with a few more professors and scholars, and perhaps interview some students on the campus as well. 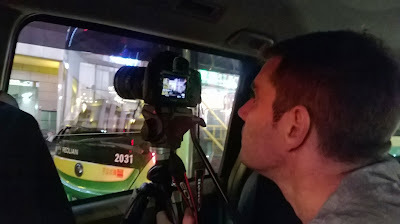 If we have time, we will attempt to create a cool time-lapse video of Macanese day turning into night too. This morning we set out on a bus to explore Macau and to scout for filming places. We drove through the almost rural-like Coloane where gambling is non-existent, and started to come across signs of money games only as we approached Cotai. Among the first signs was a bus stop which had several free casino shuttle buses were parked. 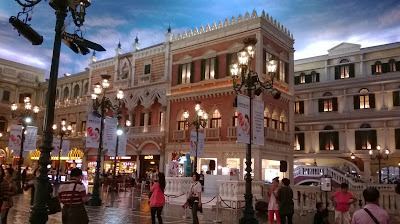 Then we arrived at Cotai Strip, the street around which most gambling activities south of central Macau are located. However, we decided not to step off yet but continue our bus tour as long as it would last. We drove through Taipa and crossed a bridge over to central Macau, ending up at a bus stop close to the border to mainland China. There as we stood waiting for a bus back to the center we admired a floating casino. 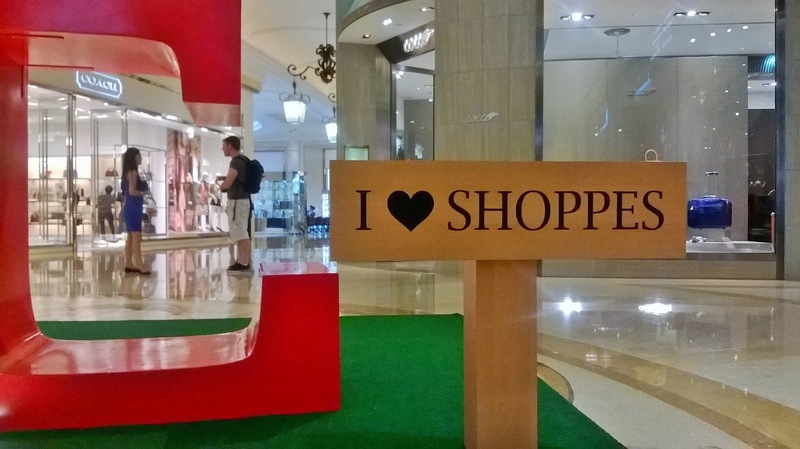 After a bus ride back to the center of Macau we visited Casino Lisboa and Wynn, our first casinos in Macau. They were pretty impressive experiences. 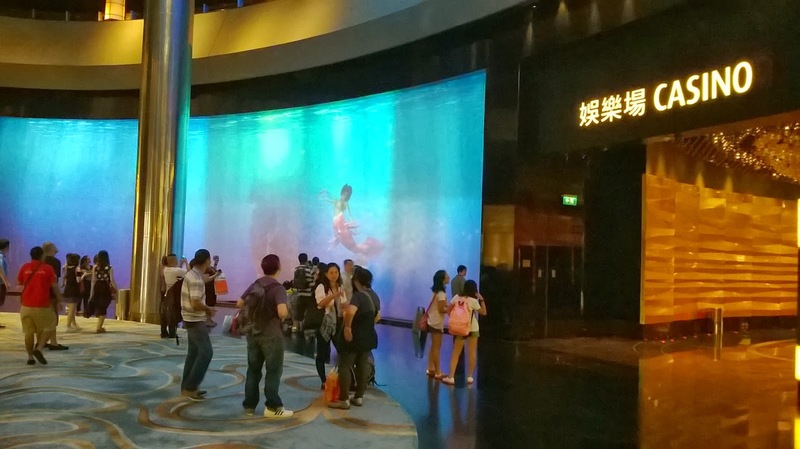 Wynne and Casino Lisboa, downtown Macau. After visiting the casinos we walked about a kilometer to the Macau Tower, and saw what Macau is like from over 300 meters above the ground. Amidst taking some pictures and footage we watched a few bungee jumpers take a plunge to a certain death(-like experience). 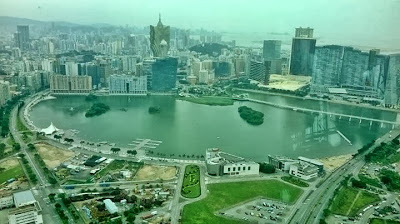 From the Macau Tower we took a free shuttle bus to City of Dreams casino in Cotai, and from there to Venetian Macao, the sixth-largest building in the world by floor area, and one of our most surreal experiences. Ever thought of taking a gondola ride inside a house? Well, someone has. The blue "skies" inside of Venetian Macao. 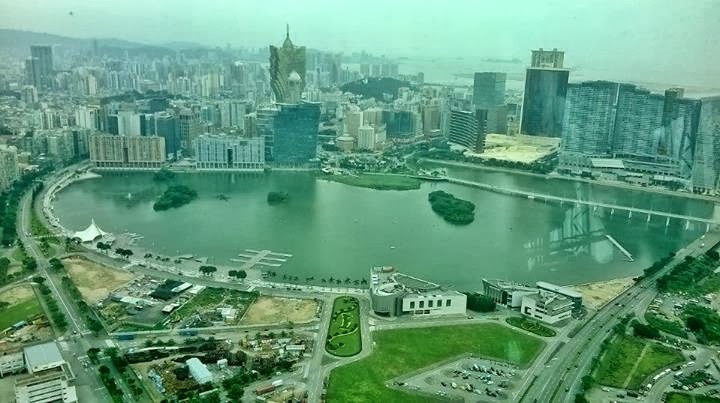 Tomorrow, we will meet our local interpreter who for the rest of the week has promised to show us around Macau and arrange us interesting Macanese to be interviewed. More about that in approximately 24 hours.